Udaipur: Prof. P.M.Yadav, Professor of Sociology, M.L.Sukhadia University bagged another award for his academic work in the field of world peace, international understanding and unity. He was honoured with Bharat Ratna Rajeev Gandhi International Award at Bangkok , Thailand. The award was conferred upon him by the former Prime Minister of Thailand Mr. KornDevorancy, Queen of France, Member of UP Women's commission Dr. RolyTiwari and Managing Director of Kamal Biomagnetic holistic Health Care Bangkok Mr. Kamaljeet Singh. 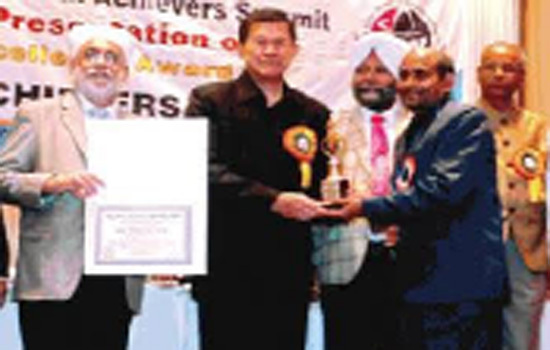 Prof. Yadav has been awarded international awards in many countries including Kazakistan, Saudi Arabia and Japan.